The NRA convention just concluded a few days ago, and let me say that I had a great time — not being there. But I’ve been thinking about the NRA for the last week because of the ongoing fuss over Volvo “Life Paint” — the amazing new reflective paint that Volvo thinks will bolster their image as a cuddly car company. Spray this paint all over your clothes and your bike and the drivers of cars might be less likely to run you down. And people interested in “bike safety” can’t stop raving about how great Life Paint is. So back to the NRA. Whatever you may think of the NRA, the organization can be boiled down to three interests. First and foremost is the interest the gun industry has in selling guns. Lots and lots of guns. In a tie for second place are two other interests in service to this bottom-line imperative of the gun industry: Gun rights and gun safety. For a discussion of gun rights, feel free to find another webpage, such as the comments section of this video. Go on. Go away if that’s what you want to talk about. Which would you rather be wearing when the shooting starts? Volvo Life Paint (left) vs. Colt Camo Paint (right). I want to talk about gun safety and bike safety. Even the NRA gets gun safety right, but almost everyone gets bike safety wrong. I am not talking about hunting safety or shooting sports — I do know that hunters wear the same bright orange vests that safety-obsessed bicyclists like to wear. Equally, I’m not talking about cycling sports that occur away from public streets. Many members of the NRA believe it’s okay — preferable even — to walk around armed every day, when done right. And many bicycle users believe it’s okay — preferable even — to use a bike as transportation every day, when done right. But have you ever seen any gun industry publicity that emphasized, How not to get shot by our product — and if you do it’s your own fault? Any bike safety curriculum you might look at is permeated with the threat posed by cars — between the lines and right there in the lines. Bike safety education has very little to do with how you might hit a rock at 11 miles per hour, fall off your bike and sprain your wrist. Or how to keep your kid from falling out of a bike child seat. We don’t call gun safety shirt safety, so why do we call car safety bike safety? Suppose gun maker Colt’s Manufacturing Co. started a PR campaign touting a high-tech, spray-on paint they’ve developed — “Camo Paint” that will help make you less visible in the event of an armed robbery, a mass shooting, or some other scenario where being seen by the shooter is your biggest liability. We’re walking around in clothes that were designed 100 years ago when there were far fewer murderers. Camo Paint protects shooters from shooting more people than they would otherwise see. You’ve just got to be as invisible as you can, and that’s the good thing about Camo Paint; it just makes it very hard for you to be seen. Putting something on that will make you out of sight of maniacs like me is a fantastic thing. And the next time the news reports someone shot by a homicidal lunatic, imagine people wondering aloud, Was the victim wearing camo? No gun manufacturer would ever do that. The gun industry has limits to its audacity. God, I hope I’m right about that. But this is exactly the game that Volvo is playing, along with the rest of the auto industry, the insurance industry, and many local governments. When we bike advocates get excited about Life Paint, we play along too. Volvo doesn’t want to remind you that their products are deadly when operated by a distracted driver on public roads designed at the expense of all other safe transportation options. Just as Colt doesn’t want to remind you that their products are dangerous in the hands of… well, dangerous when in hands generally, but particularly when in the hands of someone who has decided he or she wants to shoot innocent people. Over time, I’ve become less inclined to talk about bike safety. Now I’m going to stop talking about it altogether in the context of commuting and cycling for daily use. And when someone talks to me about bike safety, I’m going to say, “I believe you mean car safety.” Yeah. I’m going to be that guy. In spite of Life Paint, I still have a soft spot in my heart for Volvos. I owned a 1974 Volvo 145 that was totaled when I was t-boned by a red-light runner in Phoenix. I was in my 20s. I survived. But I still have a reliable neck pop that I didn’t have before, whenever I turn my head all the way to the right. Nobody has ever asked me if I was wearing a helmet at the time. Dang, a cyclist running a red light totaled your volvo? I’m surprised. Not at the cyclist running red lights, because that’s what they do, but by the damage caused by that renegade transportation user, clogging up our roads. This is such a clear issue discussed in probably the most confusing way possible. Shirt safety? Camo paint? Camouflage is a product that doesn’t exist? Don’t gun makers sell their own brands of camo outfits and orange vests? 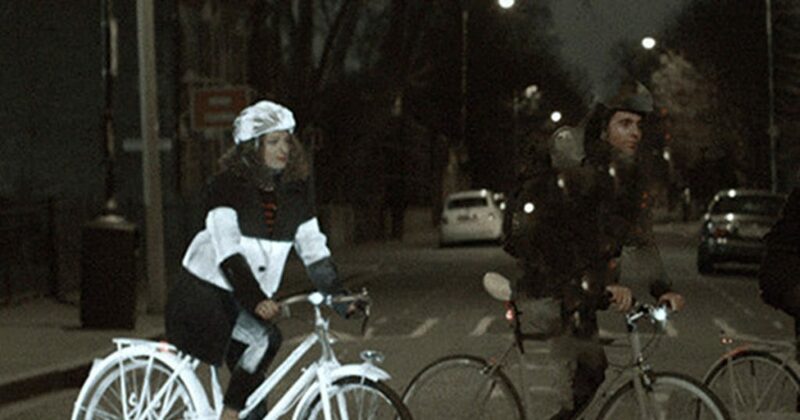 Marketing safety products like life paint seems to place the onus of responsibility on cyclists, I get it and I agree. You could have just said that. Insisting on car safety is just the other extreme. Granted, on shared streets, the operator of the metal eviscerator machine needs to look the f*** out, but the cause of bike/car accidents isn’t strictly car operators driving with abandon. The problem is that traffic infrastructure doesn’t accomodate bikes even though cyclists make a worthy fraction of traffic. Car drivers generally drive as the streets allow, which ends up colliding cyclists and cars far too often. 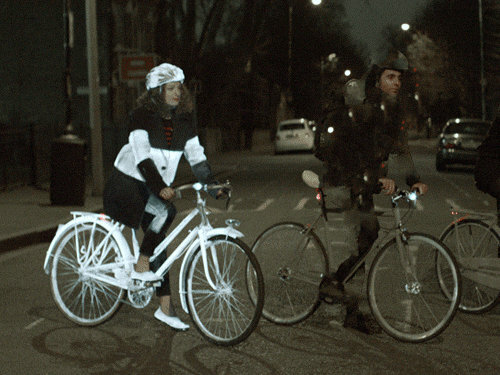 People will wear life paint and helmets and seatbelts, as well they should because traffic is a dangerous environment in its current configuration. Until the streets don’t force cyclists to ride with cars OR cars with cyclists, we all need to practice traffic safety. That said, the automotive industry is responsible for how our streets are organized, so f**** Volvo. F*** any company that does sunshiney PR crap like this. But thanks for the nice safety product at least.